First Line: Griffin coughed blood into my face when I made to slip the chains under his shoulders. Divided into two halves, Tower tells the parallel stories of Nick and Todd. It's the classic tale of childhood friends pulled toward different sides of the law, each scene filling in backstories, love lives, errands for a Bible-quoting gangster named Boyle performed under the watchful eye of Griffin the enforcer. This is the first-- and so far only-- collaboration between noir masters Ken Bruen and Reed Farrel Coleman. Their styles blend together perfectly with not one wasted word. The story of Nick and Todd is both brutal and tender, raw and poetic. I don't read many noir novels, but I have learned that Ken Bruen, that mad Celt, uses language like no other. He was the one that drew me to this book. 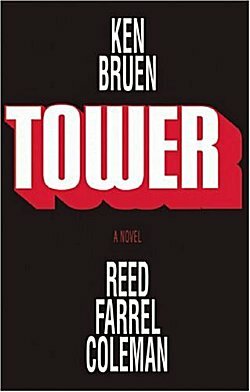 In reading Tower I learned that Reed Farrel Coleman can match Bruen stride for stride. There's something quite visceral about their writing; it's like being stabbed with a knife, and as such, you never quite forget it. There's not much that can be said about this collaboration. It's powerful. It's memorable. And it certainly makes me want these two to join forces again.